Wayne Stewart Builder have been premium home builders Melbourne, since 1991, with an aim to delivering exceptional quality and an enjoyable building process. Wayne holds the Builders Licence for the business (Registration number DB-U 3454), and now performs the roles of construction and project manager. 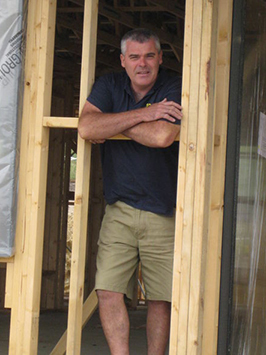 With his background in Carpentry and a passion for robust building methods and a love of beautiful timbers, Wayne has built a strong reputation in the industry. Colette’s role is primarily to be there for our customers, answering questions and keeping them informed, and also running our busy office, to ensure that construction progresses smoothly. We also employ a reliable team of experienced and professional tradesmen, who share our values and work ethics. We have always been proud to deliver high quality building work, and great customer service; so much so that we put our family name on each and every home extension, renovation and custom home that we build. One of the biggest investments you’ll make in your life is renovating or extending a home, or building a new one. Our goal is to remove any stress and worry that can go along with selecting a trustworthy, reliable builder and to deliver an efficient service for our clients. W and C Stewart trading as Wayne Stewart Builder has built up a professional group of fully qualified tradesmen, as well as a dependable association with highly reputable suppliers, working closely together to complete your building project. All of our tradesmen are fully qualified and have the relevant registrations in place. By engaging our teams of professionals we are able to ensure high quality workmanship and a beautiful and unique home for our clients. This makes us one of the best premium home builders in Melbourne.